"I'd never been to California or LA. In my early twenties, I sold all of my saxophones to a store in New Jersey except for the horn my father gave me, a 1965 Selmer Mark VI. I packed my 2002 silver Saturn and drove west." Saxophonist Adam Turchin's impulsive decision seven years ago was a risky and romantic move that has proven to be a worthwhile gamble. After performances on albums by Kendrick Lamar, The Game, and Terrace Martin, Turchin is ready for the spotlight, writing, producing and playing ten different instruments on his debut album, Manifest Destiny, an autobiographical chronicle to be released through Ropeadope of his journey from Philadelphia college life to the sunnier streets of in the City of Angels. When Turchin arrived in Los Angeles, he found a gig trading what he knew: saxophones. A chance encounter with saxophonist and producer Terrace Martin changed his life. The two locked in on the intricacies of various vintage reed instruments and Turchin found himself invited to a session that night. Martin, a fixture on the Los Angeles jazz and R&B scene, took the enthusiastic East Coaster under his wing and brought him around town. Nearly half a decade into their friendship, after recording and performing gigs such as the Soul Train Music Awards together, Martin suggested Turchin bring his baritone saxophone to the studio "just in case" for Kendrick Lamar's To Pimp a Butterfly sessions that he had been attending for months. 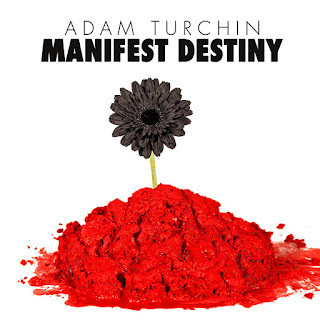 As the finishing touches were being put on what would become one of the cornerstones of modern hip-hop and the bleeding edge of jazz, which would go on to net eleven Grammy® Award-nominations, Turchin was recruited to record on the album. Laying down baritone sax as part of the major horn component on the Lamar's "u," Turchin was no longer just an observer but a participant in a major musical movement. As the studio time for the album became more prominent in his schedule, he realized he could remain at his monotonous day job or watch and participate in history being made; and the choice was clear -- Turchin quit the saxophone trading gig and pursued recording and performing full time. "That's where things changed," says Turchin. "In the early morning after we recorded 'u,' I went home and wrote the song '5:55am.' While the album had already been in the works for months, the TPAB sessions were shaping how I perceived music, how I wrote music, and how I produced music -- that's where this song came from." Two years later, Turchin has arrived with a rich album of lush soul and orchestral swells of lysergic wanderlust. His band, which includes Terrace Martin (whose recent Grammy® nominated album, Velvet Portraits, Turchin was heavily involved in, playing tenor and baritone sax and working on the administrative side also) as well as vocalists Rose Gold and Kate Faust, is a tight ensemble, not overwhelmed by guests but instead performed mostly by Turchin. That's not to say that he didn't get some other highly regarded friends such as rapper Javier Starks, trumpeter Josef Leimberg, electric guitarist Marlon Williams, and others join the project. "The album is full of reoccurring themes, both musically and lyrically," he says. "Musically, the album is chock full of Easter eggs, secret passages, hidden tunnels and other fun secrets. Melodies come and go all over." The hip-hop funk essay "My Mind is Moving So Crazy" features rapper Brandon Ashe and Snarky Puppy drummer Robert "Sput" Searight, while a deconstructed and soothing version of this appears again later as an instrumental interlude on "AE." "Like a Ghost," shrouded in an analog crackle, is the more subdued approach to "Coast to Coast," a track which features Turchin's voice layered over Gold's singing on top of a warm bed of saxophones. The tune is the soundtrack for a coin-op racecar, wet pavement flickering by in a haze of determination, the score incrementally rising higher and higher. "Vanished into thin air like a ghost, I hit the road when coast to coast" Turchin sings over the simmering ensemble. "Gold Rush" is a classic, West Coast laid back groove co-produced by Martin. "This track is the melting pot of some of my favorite styles," Turchin explains. "It has complex jazz chords, beautiful swirling harmonies, classic Mini Moog funk synth lines and Terrace's West Coast 808 to pull it all together." "Everything is very intertwined. It's an album for people who like to listen and catch the secrets. My voice is on every track -- background voices, percussive voices, singing. It was important for me to step away from the saxophone become a producer and songwriter." The album opens with the title track, a soaring swell of horns, including trombonist JP Floyd. It is a warm welcome, full of promise and mystery. It is a preparation for conquest while album closer "Memories" is the culmination of Turchin's journey. Ashe returns with a smooth, auto-tuned purr before a swarm of horns and synths swirl in, overtaking the track with a tense free-jazz climax. Apart from his work with Souter, Turchin teamed up with painter Jackie Stanton to create a painting for each major track on the album -- she also constructed a much larger painting while Turchin and Souter worked on the sculpture, replicating their creation -- expanding on the idea of the silk flower and the dreams that await those willing to take a chance. "I am a musician and my specialty is in music however I can't be held within just music. I'm interested in mixed media, cross-boundary ideas. This is not just an album of music. In my mind, this is a destination where all different forms of art meet." Clearly, Turchin has no regrets about his decision to head west. He has found a welcoming community and they have helped to nurture his unique voice amid the clamor. He is possessed by the spirits of soul, rock, funk, jazz and hip-hop in a city that embraces all of those sounds. "Where else can you drive from the beach to the mountains during a day?" he asks. "I feel like anything is possible here. I feel like there is a time-space continuum that exists nowhere else in the world. In LA, anything can happen in any amount of time. People get old quickly, they can stay young forever. That's an exciting feeling."